Happy Monday everyone ~ It's Giveaway Day! Sew Mama Sew's biannual event is finally here! For those of you whom are new here, I record and publish a quilting podcast of my own called The History Quilter Podcast. I began recording my own podcast as a way to give back to all of the other quilting podcasts out there which allow me to be entertained and educated while washing dishes, exercising, gardening, etc. Because I get so much out of the quilting podcasts I listen to, I wanted to share them all with you: here is a list of my fellow quilting podcasters and locations in which you can find them via iTunes or Podbean. After you have entered all of the giveaway's you possibly can, come back here and please check out my fellow quilting podcasters - I promise you will be entertained and educated. Quilting Podcast list - in no particular order. Click on their name to visit their website. The History Quilter Podcast ~ yea that's me. The Quilting Pot Podcast - A.J. In honor of Giveaway Day, I'm giving away the complete quilt kit you see below which includes the Walkin' the Line pattern, 8 fat quarters, borders, binding and backing. The quilt will measure up as 51" x 71". My giveaway is open until Friday, May 25th at 5:00pm Pacific Time and I will announce the winner on Saturday. I am happy to ship internationally so all may enter. Enjoy your Monday ~ yea it's Monday! I listen to podcasts to be entertained while doing something else. I listen to quite a few of the quilting podcasts on your list. And thanks for the list so I can check out a few I'm not familiar with! i haven't really listened to podcasts before.. maybe I should start? sorry to be of so little help, thanks for the chance! I love to listen to audio books and watch quilting youtube videos, but I've never listened to a podcast. I guess maybe I should, just never thought about it. Thanks for the list, I will try them out. Your giveaway is scrumptious! Definitely my colors. I have never listened to a podcast. I am pretty much technically ignorant. I would if I could figure out how. Can I watch them on my iPad? My husband just told me last night that my Facebook/blog addiction has been taken over by a podcast addiction. I have been listening to the History Chicks which I love! History is awesome and those gals are funny and have great voices. It is way more fun to learn when you can laugh and just generally enjoy what is being shared. I have discovered that voices play a big part for me. I have tried a few podcasts where the voices were lacking, or kind of grated on me and I could not carry on listening. I like those personal detours off topic too, as long as they don't leave me hanging with whatever they were talking about. I'm sure there are other things that draw or repel me, but now I have to get my kids off to school. :) Have a great day! I never listened to a quilting Podcast. I've heard a few comedians though. YES, I am a huge podcast fan. In fact, I scoured your list, hoping that you had one listed that I had missed. (nope) I listen because I feel like all of you podcasters are my friends, chatting with me. OK - chatting at me (grin) but even if you don't know it, I talk back to you too. And you all inspire me to quilt more. Susan, I must admit I don't allow myself the time. But, after reading some of these replies, I could just let 'er go while I do another task. Goning to give it a try today, while I'm packing. Oh, I will be listening to you of course. I do listen to podcasts, mostly while a work or go for walks. Thanks for a great give away. I've never listened to a podcast. I don't know anything about podcasts. Sorry thats not much help! I listen to lots of podcast as I commute, mostly quilting and knitting. Of course I listen to yours! I love podcasts, this is fantastic, I'm so glad to have discovered yours! What a fabu giveaway! I listen to This American Life - I like the snippets of stories. Sometimes it's like a window into someone else's life...someone I would not run across on my own. And the production is fabulous! I don't listen to podcasts regularly but I sometimes listen to PlayfulDay and iMake, both because they are UK based and I feel they speak to me at a Brit than some of the US based podcasts. Um... what is a podcast? I am so behind on things like that! I've never listened to a podcast. Although I do listen to audio books while I sew. I don't listen at the moment. I used to, but stopped. I don't listen to podcasts....i do listen to sermons online...does that count, or biographies about christian men / women!!! Hi Susan, I listen to all the quilting podcasts and have since the beginning. I learned about podcasts from an article in a quilting magazine; they are the only reason I purchased an Ipod. I listen because they give me ideas and because I feel like I have a quilting friend with me whenever I want. Thank you for this nice list of podcasts all in one place! I have become a quilting podcast addict, and I'm putting the blame firmly on you ;) I like to listen while I'm sewing, doing laundry, whatever. They inspire me to quilt more, plus I'm learning all kinds of new things. Love it, love your podcast, and I love you! I've never listened to a podcast. I've always had fairly slow internet (till now), and now the sound is out on my computer. Sad, no? Thanks for a great giveaway. I've never tried a podcast. I should! I listen to Mormon Expression podcasts because they have a lighthearted way of explaining what Mormons really believe. I cannot wait to dig into quilting podcasts though, I had NO IDEA they even existed!! I've listened to quilting podcasts occassionally, but not regularly. That is a gorgeous kit! I haven't listened to podcasts but just got a laptop so I could take it in my sewing room and listen while I sew. I think I'll have to try that! Love the colors and fabrics in the kit. Thanks for the chance to win. I haven't heard any of your podcasts, but I definitely need to start! Hi Bee Mate! 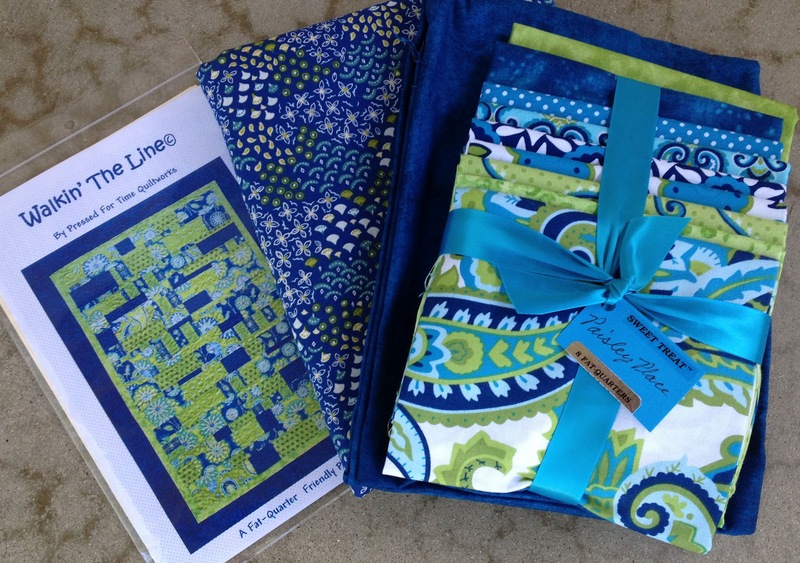 What a lovely quilt kit you are giving away! I currently don't listen to podcasts, but after reading this post, I totally want to check it out! Thanks for the information, it sounds like something that I could learn a lot from. I don't listen to podcasts too often. It's quite simply a time thing. If I do listen to something, it is usually music. I had never listened to a podcast and I did not even knew what it was so I'll take a moment and listen to a few in your list ! I have been listening to several quilting podcast but sometimes the sound quality makes it a challenge. I listen to them while I sew or embroider. You have a pleasant speaking voice and you are easy to understand. I listen to all the quilty podcasts and a bunch of others. They keep me entertained in the car, while doing housework,at the grocery store, at the gym, when I quilt, and when prime time TV is too bad to watch. I also listen to the Capital Steps, Freakonomics, The History Chicks,The Moth, Movie Date, Wait Wait Don't Tell Me, Planet Money,The Nutrition Diva, The Raw Food podcast ( I eat meat, but I like this podcast),TEDTalks, This American Life and Radiolab. I also listen to several books a week. I've listened to a podcast about eating organic food. I find it interesting to see how someone tries to make better choices about the food they eat. I don't listen to any, but my husband downloads them and listens to them on his train journey to work. The only podcasts I've listened to were for nursing school courses. I do not but my dad and husband listen to Achient Faith Radio. Good stuff. I used to listen to some - I need to check out these quilting ones! Thanks for the info and the giveaway! I've never listened to a pod cast, but hope to learn how to soon. ...mmm podcasts?not my thing! but i love the radio! I am new to this world of podcasts and am sad to say I am yet to listen to one! I had never heard of them until 4 weeks ago so will add you to my list to re-visit and 'listen' to!!! Great giveaway - thanks for the chance. I haven't listened to podcasts, but I listen to audiobooks. I may look into the podcasts. I didn't realize there were so many available that would interest me-quilting. I don't listen to any podcasts. My hubby downloads some to his iPod, mostly buddist lectures. I spend more time than I should reading blogs and don't dare add anything new! Sorry' I don't listen to podcasts....I find it difficult enough to operate my Iphone....lol. thank you for this chance. Thank you for the list of podcasts--I already listen to several of them, including yours. I listen to learn new things about quilting or knitting. I also listen as an alternative to NPR on my commute and I love to listen while I'm sewing or crafting. What a fabulous giveaway! I've never listened to podcasts. I probably couldn't hear it with my four kids under 7 running around here. I don't really listen to podcasts. Right now I'm too busy raising 3 little ones, so my headphone time is limited. Thanks for the chance! I do not listen to any quilting podcasts, and it is simply because I do not understand quite what they ARE, how to access them, how much they cost, etc. I betcha I am not the only one who is in the dark! Thanks for your lovely giveaway. I listen to talk radio podcasts when I have extra time. I like to because they kinda keep me company and I can learn new things. You know, I used to listen to knitting podcasts all of the time, but I fell away from it a while ago. It never occurred to me to find quilting podcasts, I'll have to do that. Thanks for such a great prize, it is so me! I listen to podcasts off and on. I've never thought to listen to quilting ones! I listen to BBC "In our time" podcasts fairly regularly - the historian in me needs feeding! Thanks for your podcast and this great giveaway! I don't listen to Podcasts - no time between work and family it's all I can do the get some quilting time in! Thanks for the chance to win! I love to listen to quilting podcasts when I can, but I don't have time often. I like to listen to podcast from How Stuff Works. Since you like history do you listen to Stuff You Missed in History Class? I have never listened to a sewing podcast but I am going to check some out! I tend to only listen to podcasts from conferences or church sermons which I have missed. Otherwise I find I don't have enough time for podcasts. I absolutely love podcasts, I listen to them while biking to and from work *and* while sewing! However, I've never tried out a quilting podcast before. I listen to a lot of NPR podcasts right now such as "Tell Me More," "Afropop," "Radiolab," etc. You've inspired me to give quilting podcasts a try! I never listen to podcasts because I never remember to download them to my computer and I do not have an MP3 player. My son listens to sermons and books. I don't listen to podcasts but it sounds like a good idea. I listen so I always have a friend sewing with me! the 1st podcast i listened to was Annie Smith Quilting Stash then Alex Andersons and older ones by Nadine Ruggles. . . thanks so much for the links of different podcasters. . . . i love sewing, quilting and crafters podcasts. I listen to a few podcasts from CBC radio here in Canada. They are great entertainment on long car trips! I like listening to quilting podcasts to learn about new designers and books and happenings. I don't listen to any podcasts, maybe I'll start this summer. I haven't listened to any in a while but i've been thinking A lot lately I need to download some new ones! I enjoy listening to sewing and quilting podcast and positive/gentle parenting blogs, to gain skills in both! I actually listen to you as well as Jackie. :) I love podcasts and often sew while listening to them. I also subscribe to American Patchwork and Quilting Radio, Freakonomics, and NPR Science Friday. It's great to learn something new while doing more automatic sewing tasks like chain-piecing or cutting charms. Thanks for the chance to win! I don't listen to any podcasts, really. I listened to a few, but hate that there are 3, 6, 15 and then the host stopped posting new ones just when I was getting interested. So now I listen to Pandora instead. There's a quilting podcast?! Fantastic! Currently I listen to science-based podcasts, from the UK, usually astronomy-, physics-, anthropology-, geology-, geography-related. Now I can add yours. Thanks! I have never listened to a podcast. No particular reason for this I guess I have just never had the time. Thanks for the chance to win the quilt kit. I've never listened to a podcast before but I have often listened to audiobooks. They're great in the car or even while I'm surfing the web, rather than listen to music. I've never listened to podcasts. My kids do all the time and maybe it's time I learnt how to do it and get dragged into the 21st century! I listen to pretty much no podcasts. I watch TV and listen to radio. I don't know when I'd put on a podcast. Maybe I'll have to take what Laura does under account and try to take them with me. I listen to audiobooks all the time, but I've never listened to podcasts. Will have to try them out now that I've found your site. Thanks for the chance to win. i don't really do podcasts. very occasionally my hubby will pop one on my ipod. its usually comedy which i'll listen to cos its very amusing. I've never really listened to podcasts before although I used to love listening to audiobooks on long journeys as a child so maybe I should start. I listen to sermon podcasts from North Hills Community Church in Taylor, SC when I miss a day. For personal spiritual growth. And lots of photography business related podcasts... for business related growth. I listen to NPR pod cast but didn't know there were quilt ones. Now lots more things to listen to, thanks! Thanks for the giveaway. I don't listen to podcasts, but I will check yours out! I listen to BBC RAdio 2 - Simon Mayo. He has a number of different things happening and always makes me laugh. I never heard, not found in the Portuguese language is nothing that attracted me, listen to radio much is online, not live without music. I mostly listen to knitting podcasts, so I really appreciate your providing this list of quilting podcasts! My favorite is Knitting Pipeline -- Paula's content is very interesting, and her manner is really warm and engaging. Also, the sound quality is really good, which is why I have stopped listening to some crafty podcasts. I also listen to iMake, which I like for the same reasons. I am off to iTunes to start downloading some of these to listen to today! Thanks so much for participating in Giveaway Day! I listen to the Ricky Gervais podcasts purely because they are hysterical! I haven't listened to podcasts but I like the idea. Guess I'll need something to listen to them on first! Love the fabric etc you're giving away. What a gorgeous selection. You know I listen to many but am so far behind it isn't even funny. I am just starting to place my foot back on the podcasting and blogging trail. Work has taken me away from it temporarily but I was never far away!!! I love listening to the cooking ones, but really have not listened to others. Thank you for the list of podcasts! I have not listened to them, but I will try them out. I guess it is just a matter of being stuck in a pattern that keeps me from listening to them. Thanks for the wonderful giveaway chance!!! I don't listen to podcasts ever! I listened to one on my iPod Touch before it died (refuses to charge now) and I couldn't really get excited about it. I don't learn well orally (I really need to see stuff to understand-give me a book anyday!) plus I feel like I need to be able to hear what my 2-year-old is up to at all times. I'm a weirdo though-back when I ran cross-country I never trained with earphones because I felt like I couldn't hear what was going on around me and that bothered me. Anyway, I'm definitely not a podcast person! I like to listen to non-fiction books and NPR when I'm sewing. I've found that it's easier for my attention to sort of wander and then jump back into listening when it's news/non-fiction as opposed to a story with a plot line! I do also listen to podcasts, sometimes, but sometimes I just forget about them! Thanks for the links to so many! I don't ususally but when I do I like crafy ones! I really enjoy the "Useless information" podcast through iTunes. I enjoy it because I learn a lot from it and they are all fun facts that I enjoy sharing with other people. I haven't listened to podcasts. Never really thought to do so while sewing. I may need to change that habit. Thanks for the chance to win your giveaway. I listen to podcasts from my favorite pastors because they help me focus on god throughout the day. I also listen to the podcast from the authors of freakonomics - I love thinking about why things in the world are the way they are! I really enjoy listening to CBC radio via podcast. Hubby is into political stuff. I love NPR's This American Life podcasts -- I listen to them while I'm at my day job to help make things more interesting! I think the host, Ira, has such a fantastic way of finding stories that are interesting and relatable. I highly recommend it - I feel like I learn really fascinating things in every episode! Wow this is an amazing prize - no wonder there are so many entries. As for podcasts - I have never (as far as I'm aware) listened to any. Too much to do - too little time and I'm sure I could quite easily get hooked. Haven't listened to any podcasts. I actually listen to ESPN sports pod casts. I haven't checked out any sewing or quilting pod casts. I don't listen to any podcasts! but maybe I should! I listen to a few knitting podcasts. I don't have any local friends who knit, so it's nice to hear people just chatting about their projects. I haven't gotten into podcasts. sorry! I don't actually listen to podcasts. I listen to music when I work, but I can't work and listen to spoken word. Commuting time is wind-down time for me, so no noise at all. I listen to all but one of the podcasts you listed plus a couple of podcasts about podcasting and some that the evil Nonnie got me interested in about the tv show Once Upon a Time. I've never listened to a podcast but I do listen to audiobooks when I'm sewing. I'll try a quilting podcast soon. I've never really listened to podcasts. Hm, I never rally tried podcasts, I don't know why... Thanks! I used to listen to knitting podcasts, but I'm not an itunes user anymore. I don't really miss it, either. I usually do audiobooks through audible or the library. I haven't listened to a podcast. I've only listened to a couple of quilting podcasts. I usually don't have a lot of time on the computer, so it is something that I have not done alot of. Thanks for your very generous giveaway. I've actually never listened to a podcast! I should while I am working on sewing rather than listening to music. Ive been listening to Kirtan podcasts! Im a yoga teacher and Kirtan helps me connect with the divine in me. I don't listen to podcasts. (I prefer quiet.) Thanks for the giveaway! I listen to tons of NPR podcasts. Wait,wait, Don't tell me (they're funny and smart), Pop Culture Happy Hour (they're funny and my age), American Life (they're funny and quirky). I listen to This American Life a lot while I sew, but I haven't tried any from your list. I'm grateful for it, though, and will check them out this week! I have never listened to a podcast. I usually listen to Pandora while sewing.. I am wanting to break into quilting and what a better way than have everything right here! Ekk!! What a great giveway! I haven't listened to many podcasts lately, but in the past I have listened to bible sermons through them. I actually didn't realize there were ones for quilting, cooking, etc. I'm going to do some more research now! :-) Thanks for the giveaway! I have never listened to a podcast before but after reading the titles I might have to find time somewhere to do that. I do not regularily listen to podcasts. Of course, now that I know there is one about quilting, that may soon change ;) Thanks for the chance to win this beautiful quilt kit! Don't usually listen to podcasts but it sounds like a good way to broaden my horizons. I listen to several public radio podcasts (TAL, The World in Words, Wait Wait Don't Tell Me, Radiolab, etc..)-- I love to learn new things and I love listening, so the medium is a good fit for me. I downloaded 2 of Rhonda's podcasts in the past (Quilter in the Gap) and listened to 1.5 of them. Here is why I haven't been back to them...I hate earbuds, which I have to use since no one else in my family wants to listen, so that is strike number 1, and number 2 is that I HATE I-tunes and pretty much all things that involve using I-tunes, so it totally isn't worth it to me to get so frustrated. I hope this helps and isn't too negative sounding, I do like listening, it just doesn't seem to be a good fit for me to get them and listen to them...does that make sense? Sorry because I never listen to any podcasts before. Maybe I should start. Hmm, I've tried an NPR podcast, but somehow have quite gotten the hang of finding/storing/retrieving something I want to listen to! I need remedial podcast classes! Maybe I'll try to find yours! I haven't listened to any podcasts recently, but apparently, I'm missing out--so I'll be starting to! I love to listen to podcasts! To a running podcast while I run, to shows like Wait Wait Don't Tell Me because I never seem to be home at the right time to catch them on air, to A Way With Words to satisfy my inner word nerd, and to crafting podcasts to share ideas with other crafters. I listen while working out, sometimes in the car, doing housework, doing simple craft work. They're excellent company while cutting out pieces for a quilt! I've never listened to a podcast before. This is an embarrassing admission, but I listen to Judge Judy and the People's Court when I'm crafting. I've never listened to a podcast, because I guess I'm more a visual learner. With the great list of podcasters (?) you supplied, I may give it a try! Thanks for a very generous giveaway! I have not listened to podcast before. Sorry but thanks for giveaway. So I was trying to decide whether or not to take a quilting class and figured I'd listen to a podcast or two. It's all Frances' fault. She got me to Pam, Tanesha, Sandy, you and Katie and Daisy and now it's just a free for all. Add all of you to the knitting podcasts, NPR and miscellaneous others and I've always got earbuds in my ears. We all drive, walk, knit, sew, cook and clean together. Bet you didn't realize how much fun you were having. Me? What do I know? I hear voices. Radio Lab rocks my socks! They approach topics from a scientific and often philosophical perspective and I love it. Plus, they tell good stories along the way. I have only listened to a few pod casts ever had never in a million years thought their would be a quilting one will have to check it out. I have never listened to any podcasts, but I am about to! Thanks! I didn't know there were quilting podcast. I listen to Stuff you should know. I think they are hilarious and it is interesting listening to how different things work. Yes! TED talks are great--they make me feel like I can change the world. I also like "This American Life" for the neat stories. I don't listen to podcast. I am not technology advanced. My husband is....I might want to try. I don't listen to podcasts at all, sorry. I prefer to sew in quiet. I listen to all the podcasts you listed and you all are like family to me. I listen at work and it makes my day go faster. Love to hear about your school activities and your quilting adventures. Keep up the great work!! I haven't listened to any. I listen to podcasts of sermons by Mark Driscoll from Mars Hill Church. I love his sermons. They really challenge me. I'm so bad I don't listen to any podcasts, but I see the one from Pat Sloan advertised all the time and I read her blog. My friend listens to I think Alex Anderson's one? Thanks for informing me...I'll bookmark this site for sure! I have not ever listened to podcasts- I have listened to Ted discussions and other such things through You tube- I know of a couple of podcasts- Pat Sloans and Jackie Kunkel. It sounds like an interesting way of learning new things. Thanks for participating in the bloghop. Your quilt kit is in some of my very favorite colors. I listen to the podcasts from colonial Williamsburg and play them for my students. I don't have I-tunes on my computer but maybe I will try when school is out in 3 weeks. I haven't listened to any Podcast yet but a quilting one just might be the first one I listen to. Awesome giveaway, thanks for the chance. Thank you for this Giveaway! I listen to bible study series. So far I have listened to Calvary Oceanside Baptist Church's bible study series podcast. I usually listen to it when I'm baking. It is convenient as I have my iPhone to listen while baking. I love listening to the podcasts from BBC Radio 4 while quilting. Some of them are comedy shows, or plays that I've missed. I have a Chuggington video podcast on my iPad, specifically for the purposes of distracting children I look after or my nephew! Hehe. Thanks for the chance to win! Will definitely take a look at your podcasts. I listen to a number of BBC Radio 4 podcasts such as From Our Own Correspondent and Crossing Continents. I love them as they give an insight into things going on in the world, both related to major news stories and things that never make the news. I don't know anything about podcasts, I´m not sure what thas it means.. I have never listened to any podcasts, though my husband listens to them all the time. With three kids, I cherish some quiet time every so often! I listen to all the quilty podcasts and a few others too (History Chicks, Bowery Boys, More Hip than Hippie). I find them to be entertaining but also educational. With podcasts, the programming is in my hands and I can change it with my mood. I love 'em! I listen to NPR podcasts, including A Prairie Home Companion and Fresh Air. Very entertaining. I have never listened to a podcast. I have only just worked out my computer and how to watch missed TV shows. Maybe next year!! I have never listened to any podcasts though it is something I have wanted to do. I don't listen to podcasts, I'm not really entirely sure what they are or where you'd find them! That quilt pattern and kit look amazing! I don't listen to Podcasts. I listen to podcasts about knitting. It never occured to me that there were podcasts about quilting; thanks for the great list of podcasts you listen to. I listen while I am knitting, sewing, gardening etc. It is a way for me to enjoy the company of "friends" even when I am stuck at home doing the dishes. I don't really listen to podcasts, but my husband does listen to them from the leaders of our church while he drives or mows the lawn, etc. Thanks for the chance! I don't even know what a podcast is! I think I must go ask professor Google!! LOL! I feel technicly challenge when it comes to podcast. Sorry I know it is probably easy. The only podcasts I listen to are from the Mormon Channel - my hubby got me into them. I used to listen to science podcasts, then teaching podcasts, then some faith-based stuff. Now I mostly listen to audiobooks while I do anything. I don't listen to any podcasts. Thank you for the giveaway! I listen to lots of quilting and knitting podcasts while excercising, housekeeping, gardening and crafting...after I've heard the news of the day on NPR. One can only take so much of the political news, so I check in with real people all over the world via their podcasts, not always in real time. But I feel i know a bit about life all over the world that way. Thnaks for your podcast, and the giveaway!